Stereotactic Radiosurgery (SRS) is a highly sophisticated procedure performed by neurosurgeons, radiation oncologists and radiation physicists utilizing 3-D computerized imaging to target and deliver a high dose of radiation to an affected area. Through robotic control of both the radiation source and the treatment table, converging radiation beams are focused on a single target. By delivering the radiation from various directions and angles, normal tissue is spared while obtaining sub-millimeter accuracy. Stereotactic Radiosurgery requires a multidisciplinary approach that involves neurosurgeons teaming with radiation oncologists, radiation physicists, medical oncologists, and neuro-radiologists to determine the best approach for each individual patient. 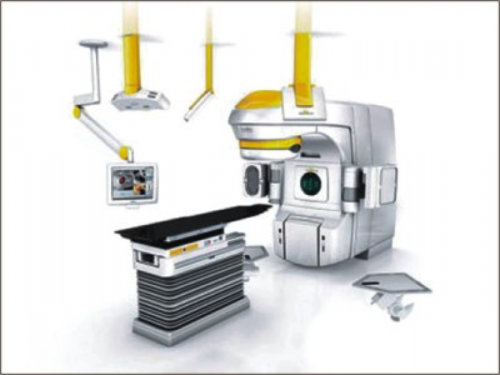 Stereotactic Radiosurgery requires no incision but delivers “surgical” precision. Common indications for SRS are brain tumors, including metastatic brain tumors, meningiomas, and acoustic neuromas; spinal tumors; arteriovenous vascular malformations (AVM’S); and Trigeminal Neuralgia. In 2003, the Florence Neurosurgery and Spine Center began offering Stereotactic Radiosurgery for its patients. Since 2014, our neurosurgeons have utilized the LINAC-based SRS (True Beam) system at McLeod Regional Medical Center. on Tuesday, 25 September 2018.